Luna was born and raised in a small village of the Great Peace city in the North, Vietnam and in 2012 she moved to Dubai, United Arab Emirates. Since then she started with learning basic pencil sketches then moved on to her main area of expression: painting. 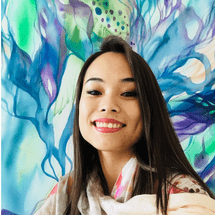 She is skilled with many different canvases; be it paper, wood, using Acrylic or Oil paint and especially very popular in her colorful silk paintings. She finds that silk, in particular, is quite practical and imaginative to work with, and has developed this technique by designing her mesmerizing Silk Art combining with a unique style of hand embroidery. "Luna is a really encouraging and inspiring teacher. She is clearly a very skilled and imaginiative artist, and she manages to create a highly positive and nurturing environment for her clients to work in."